For the past several months MustangsDaily.com has brought you previews of the new Mustangs and products that will be at SEMA this year, but the show is finally here and we will be providing live coverage of anything and everything Mustang here in Las Vegas. From the latest products to customized Mustangs, we will be bringing you regular updates complete with plenty of photographs straight from the Las Vegas convention center show floor. We will update this page with new content each day, so be sure to check back for the latest news. You can see all of MustangsDaily.com’s current 2010 SEMA coverage below. Scosche Industries, award winning innovator of mobile electronic products and accessories for the aftermarket, is pleased to introduce a dash kit for the 2010 & up Ford Mustang at the 2010 SEMA Show in Las Vegas. In an industry first, the FD1441B “Custom Kit, Factory Fit” installation kit incorporates a full color, touch screen air conditioning controller. Configurable for single or dual climate controls, the kit plugs directly into the factory AC harness making for a quick and easy install without needing to cut or splice wires. Agent 47 debuted their Harbinger race car at SEMA last year, but at the time the car was still in prototype form and lacked a powertrain. 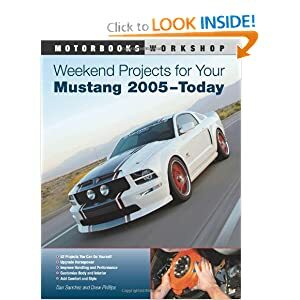 The company brought the car back for 2010, and has announced they are now taking orders for the specially built Mustang race car. Most of the modern Mustangs featured at the SEMA show this year were 2011 models, but a few slightly older Mustangs managed their way in as well. One of our favorites was tucked away in the Nitto Tire booth, a beautiful black Q650 Street Fighter from Steeda. The car features just about every suspension part from the company’s catalog including Tokico D-spec shocks and struts, billet lower trailing arms with a relocation bracket, front and rear sway bars, 3-point frame rail and torque box brace kit, bumpsteer kit and more. It seems that are always raffles with chances to win cars, but the latest one from Mustang Dream Giveaway really grabbed our attention. Announced at the 2010 SEMA show, the sweepstakes will be giving away a matching 1969 Mustang Boss 302 and a 2012 Mustang Boss 302 both painted in Calypso Coral. The ’69 has been fully restored and features a 4-speed transmission, 3.91 rear axle and has only 40,000 miles, while the 2012 will be a one-of-one Patriot Edition and will feature several unique modifications. The Ring Brothers have become legends in the custom car community for their unique designs and ability to use integrate modern materials with classic designs. The company has built several Mustangs in the past, but their latest project nicknamed “Dragon” is their very first 1970 Mustang. Vortech released its supercharger system for the 2011 Mustang well before SEMA, but this is the first time we’ve seen the setup in person. Even better, the car featured Vortech’s 20th anniversary system that features a special black finish and numbered anniversary serial tag that looks especially attractive. The kit includes Vortech’s V-3 Si-trim compressor with a 3.8-inch drive pulley, billet aluminum and steel supercharger mounting bracket assembly, and air-to-air charger cooler, 98mm MAF housing, stainless steel clamps and more. We don’t think of pink as a color that fits the Ford Mustang, but Creations n’ Chrome does it as well as anyone can. This 2011 Mustang features Passion Pink chrome paint with forged HRE wheels and a 3dCarbon Boy Racer body kit. Under the hood is a Vortech V-3 Si-trim supercharger as well as a Nitrous Express nitrous system, and additional performance upgrades a KW Suspension coilover system, Wilwood brakes and Corsa Performance exhaust system. If you want to drive a pink Mustang, then this is definitely the one. The WD-40 / SEMA Cares Mustang made its debut inside the SEMA Show grand lobby today, two months before it gets auctioned to help children’s charities. The vehicle started as a 2011 Ford Mustang GT with a 5.0-liter V8. After its transformation, it now produces approximately 600 horsepower and features a body kit, custom interior, entertainment system and paint that emulates the WD-40 brand. A virtual version of the vehicle will also appear in Nitto 1320 Legends, an online racing game and social network with more than 1 million members. After a full year of brainstorming, designing and building, Vaughn Gittin Jr. and the rest of the Need for Speed team unveiled the RTR-X Mustang at SEMA this morning. The building of the car has been documented over the last few months on SpeedHunters.com, but this is the first time that the car has been seen completed.